Throwing You Into Emotional Turmoil? Have you recently heard those words from your child? Perhaps it was “I’m bisexual” or “I’m a lesbian” or “I’m transgender.” This might have come as a complete surprise or maybe it was something you’ve suspected for some time. Whether a surprise or something you suspected, was your reaction not what you expected? You’ve always thought of yourself as open minded, accepting of people no matter what their sexual orientation or how they might be “different.” But now it’s your child and it doesn’t feel the same and you’re wondering why you are having THESE feelings? Losing friends, family, your religious community? Is this something your child is doing to get back at you? If it’s a choice and they can change? Has communication deteriorated between you and your child? Has communication deteriorated in the family? Are you concerned about not knowing what to say or saying it the wrong way? Has there been a lot of tension in your home? Are you worried people will find out? Are you worried about the burden your child will face as an LGBT youth? Being the parent of an LGBT youth can bring up a lot of emotions, a lot of questions and parents sometimes feel like they’re on a roller coaster. You love your child and you are 100% certain of that. Sometimes knowing that makes parents of an LGBT youth question themselves when the feelings and doubts come up after their child comes out. Like you, I’m the mother of an LGBT youth – well he used to be a youth! My son came out as gay in 1989 when he was 20. I must have suspected he was gay from as early as age 3. At that time I told his father, “I wouldn’t care if he married someone of a different religion or different race, but I don’t think I could handle it if he were gay.” In his early teens, I discovered him trying on my jewelry and I became greatly concerned that meant he might be gay. By the time he was in high school, I definitely suspected he was gay. He had primarily female friends, but no girlfriends. Everything I knew about him and had known about him pointed in the direction of his being gay. When my son called to tell me that he wanted to talk to me but wouldn’t tell me what it was about, I said to my husband, “Rick wants to talk to me when I go to LA but he won’t tell me what it’s about. Do you think he’s going to tell me he’s gay?” So when Rick did tell me, I was not surprised. At the same time, my image of what his life would look like was shattered. I was worried about AIDS (it was 1989 right at the heart of the AIDS crisis) and I was worried about gay bashing and whether he would be safe. I was also worried about what people would say and think. I didn’t consider myself homophobic. I had many gay and lesbian friends. But somehow, when it was MY son, it was different. Since my son came out, I’ve encountered many LGBT people who don’t have the support and acceptance of their parents and I’ve seen the long term impact this has on them. Some have found a way to adjust but for many, the pain lives with them every day. I’m not talking about the kids who were kicked out of their homes and totally rejected. I’m talking about the ones whose parents love everything about them except the part that is gay. They have to compartmentalize their lives when they go home to visit or talk to them on the phone. They can’t share many of their day to day lives, what they do or whom they see because it may involve a partner, a date or even a friend who is also gay or lesbian. And if they are blessed to be in a long term relationship, they can’t bring that person home to meet their family. Their parents don’t want to know about that part of their lives. Can you imagine for a moment what it would be like to never be able to talk about your husband or wife with your parents or siblings, to never be able to share about a vacation or a fun activity you had and to never bring them home to meet the people you grew up with and you thought knew you best? It affects their sense of who they are, their self-esteem. Some are unable to have healthy relationships – not because they are gay but because they wonder if they are lovable if they don’t feel loved by their parents. Some are underemployed, again because they question their own worth. And in extreme cases like those we read about in the papers and hear on the news, long term depression can lead to suicide. I work with parents of LGBT youth because I know the long-term impact it can have. When parents create a realistic vision of how they want their family life to be, develop a strategy to implement it, uncover some challenges that may be causing some angst for them and they see things start to change, the whole family dynamic changes. Impacting the parents creates a long-term positive impact on the LGBT youth and that’s what my work is all about. If you’re ready to make these changes in your family, let’s schedule a time to chat. Contact me at your convenience to set up a time. 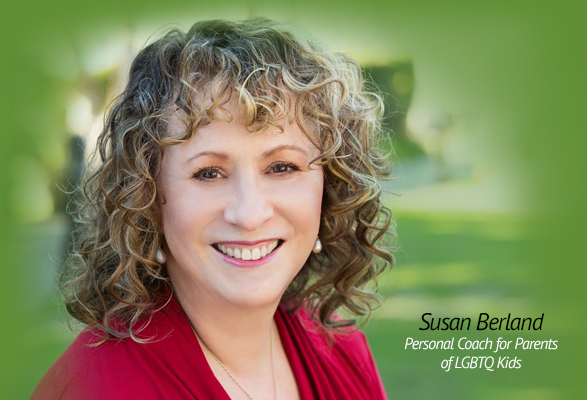 After meeting Susan and reaching out through a Facebook message, I felt working with Susan was a safe place for me to share my feelings and thoughts. I never felt any judgment from her. I found the experience excellent, and looked forward to each session. I learned to look at many sides of different issues, take a deep breath, and work through the emotions I was feeling. Working with Susan helped me think about how I was dealing with each of my children and refocus on how I was reacting to them. I was calmer. I would tell parents of LGBTQ kids that coaching allowed me to have a positive relationship with my children.